Children should be between the age of 7 and 15 at the time of auditions. Both boys and girls are welcome to audition but male voices must be unchanged. All positions are volunteer. Auditions will be held on Wednesday, May 1 from 5:30pm to 6:30pm at Union Avenue Opera, 733 N. Union Blvd., St. Louis, MO 63108. Children will be taught a vocal selection from the show at the auditions. All children must be accompanied by an adult. Please provide a photo of your child at auditions (need not be a headshot, but the child should be the only one pictured). For questions or to schedule an audition email emily [at] unionavenueopera.org or call 314-361-2881. All Children must be registered with UAO prior to the audition date. Provide child’s name and age along with guardian’s name, email, and phone number in email. Staging Rehearsals: July 8 – July 20 evenings and weekends only. Children will not be called at every rehearsal. La bohème will be performed in Italian. Children will be taught pronunciation during music rehearsals and expected to memorize all parts prior to the first day of staging rehearsals. 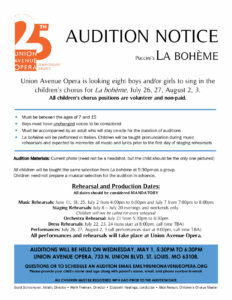 Thank you for your interest in auditioning for Union Avenue Opera. At this time we are no longer hearing singers for our 2019 Festival Season. Auditions are held annual in December/January for the upcoming festival season. Please check back in the fall for more information. Please note that UAO does not accept (or consider) audio submissions in lieu of a live audition. Additionally, UAO does not hear auditions outside of scheduled audition dates. No phone calls please.